Based in Louisiana, Schumacher Clinical Partners (SCP) is a privately held, physician-driven company dedicated to helping hospitals and providers deliver high-quality patient care. The company’s network spans 7,200-plus partner providers and more than 400 independently run facilities nationwide. On an annual basis, SCP treats more than eight million patients, providing emergency and hospital medicine. To fulfill its mission, SCP’s recruiters continually hire new clinicians, while SCP’s schedulers book new and existing providers in shifts. These clinicians need to communicate effectively to bring healthcare to patients. Communication is the cornerstone of almost every large organization, and SCP is no exception. With thousands of clinicians and hundreds of medical facilities located nationwide, effective communication was an area of opportunity. In the past, doctors and SCP employees had been interacting via various platforms: an out-of-the-box text messaging system, plus email, SMS, iMessage, and the telephone—a far-from-ideal situation. SCP partner clinicians preferred several varied methods of communication, and SCP had no efficient way of streamlining the communication process. For instance, instead of being able to send one group message to book one shift, SCP schedulers would need to reach out to doctors individually, via several platforms. “Overall, our ability to communicate with our physicians in a secure manner was very limited,” Vicky Romero, senior vice president of IT at SCP, said. In addition to removing these inefficiencies, Romero; Dr. Stephen Nichols, EVP and Chief Clinical Operations, and other SCP executives aimed to improve physician interactions with SCP. The solution SCP envisioned? One (user-friendly, efficient) mobile text messaging platform. This platform, to be called mySCP, would be highly secure (to comply with HIPAA rules) and would enable the transmission of group messages based on roles, so schedulers and recruiters could contact specific groups of physicians at once. Since out-of-the-box tools would not be able to provide the robustness SCP needed, Romero researched mobile app development companies who could build a custom solution. After narrowing the choice down to four vendors, she chose Devbridge due to its individual approach and robust technical capabilities. “I felt like they were agile, and they were listening to us,” she said. Once SCP hired Devbridge, Devbridge interviewed and surveyed SCP employees and partner doctors to inform the product design. In six weeks, the company developed and released an MVP (minimum viable product). “With traditional waterfall development, that would have been impossible,” Romero said. 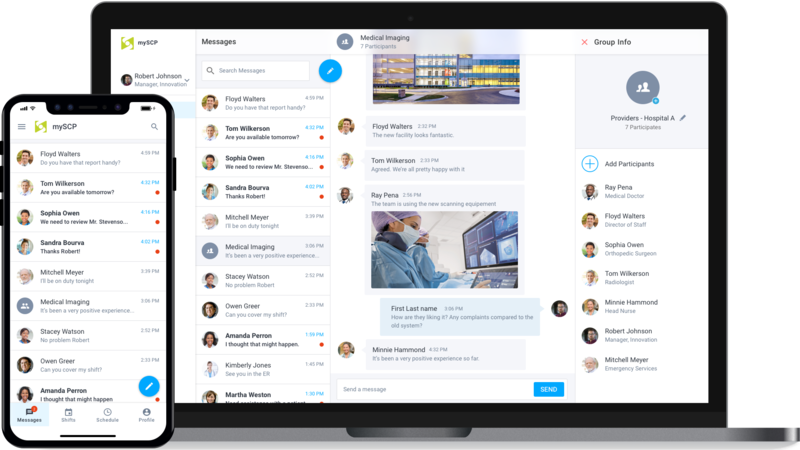 “We built a communication tool similar to Basic Messenger, but encrypted in transit, so Schumacher employees and doctor partners can communicate about patients and be HIPAA-compliant,” Dipak Prasad, a senior product manager at Devbridge, said. “We built a contact directory structure into the app, so there’s no need to look up contact information. Users can send direct, group, and broadcast messages in the system. Since the MVP, Devbridge has made many enhancements to the system, releasing a new version (based on user feedback) every two weeks. “In seven months, we have released 12 versions—each one delivered across iOS, Android, and the web,” Prasad said. One particularly innovative development is a reverse bidding mechanism for shift-scheduling. With this feature, schedulers send a group message asking doctors if they are interested in filling a particular shift. Doctors can easily communicate whether or not they are interested, whether or not they would require a cash bonus, and—if so—how much that bonus would need to be. Then, schedulers can view that aggregated data and fill those shifts with doctors asking for the lowest bonuses. Since shifts are pricier if they are filled at the last minute, being able to book them in advance also saves money. Next on the list of enhancements: the app will enable the recruitment and onboarding of new physicians. In short, it will manage the entire workflow from end-to-end with status checkpoints, such as interview-scheduling and paperwork-uploading. It will also send notifications to applicants and allow them to track their progress. Other future additions include: providing doctors with instant access to their schedules (via calendar views) and sending notifications regarding shifts, credential expiry and chart deficiencies to doctors. “The opportunities of this app have become endless for us,” Romero said. Nichols agreed. “We keep coming up with new use cases that we had not road-mapped initially,” he said. Although mySCP is new, Schumacher has already reaped significant benefits. Thanks to the app’s reduction of touchpoints (in part via group messaging and “delivered” and “read” receipts), recruiters and schedulers are saving a lot of time. 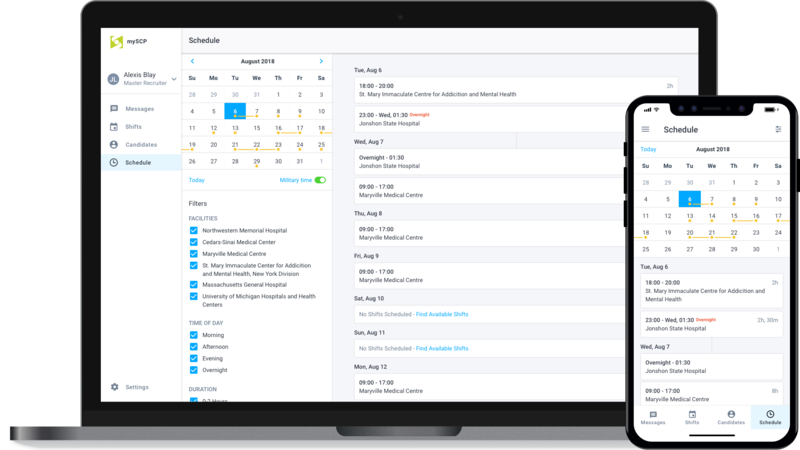 Schedulers no longer need to reach out to doctors individually. They have also been able to book shifts (including difficult time slots, such as Labor Day) far in advance, resulting in cost savings.